If you are concerned about gluten-free eating, you will wonder whether you can get a gluten free bite every time you want to order. And like with many condiments, when you want to add mustard to your barbecue, the question comes to mind: is it gluten free? The answer is not obvious because mustard is not always prepared or kept separate from gluten-containing items. Let us discuss why mustard might not be gluten-free and how to be sure that the mustard you use is gluten free. Not always. Here are the reasons. While mustard is ordinarily gluten-free, contamination can occur at different stages. Therefore, although the ingredient list says gluten-free, this might not be the reality. Researchers say that because mustard seeds are sometimes cultivated together with cereals and lentils containing gluten, cross contamination cannot be ruled out. This is a common practice in India where most mustard is grown. Besides, even if the mustard seeds were grown as a single crop, during preparation of the condiment, vinegar is used. If this vinegar was made from sources such as wheat, it will definitely contain gluten. It is worth noting that mustard manufacturers are not required to declare the source of the vinegar used. So, is mustard gluten free? Probably, and probably not! Only if enough information is provided about how the mustard seeds were grown, how they were prepared and the source of the ingredients like vinegar would you be sure of the answer. Does this mean that you should give up on using mustard? By no means. After all, it gives a great flavor to your food. And you can still get great mustard options without exposure to gluten. These include Organic Honey Mustard, Organic Dijon Mustard, Organic Yellow Mustard and Organic Horseradish Mustard. There is also Lite Honey Mustard Vinaigrette which is great as a marinade or salad dressing. These mustards are gluten-free to a level under 20 parts in a million (abbreviated as GF-20). Because Annie's mustards are prepared with vinegar made from beets or corn, their answer to the question; is mustard gluten free, can reasonably be yes. French's is popular in many parts of the U.S. Its mustards are gluten-free to GF-20 level. However, French’s Tangy Sweet & Smooth BBQ Mustard has gluten. The manufacturer advices buyers on special diets to read the labels carefully so as to confirm the products meet their individual needs. Because some French’s mustards are prepared with ethyl alcohol derived from grain including wheat, they may contain gluten. Grey Poupon is a subsidiary of Kraft Foods. The company readily provides information on the non gluten-free ingredients on their product labels. 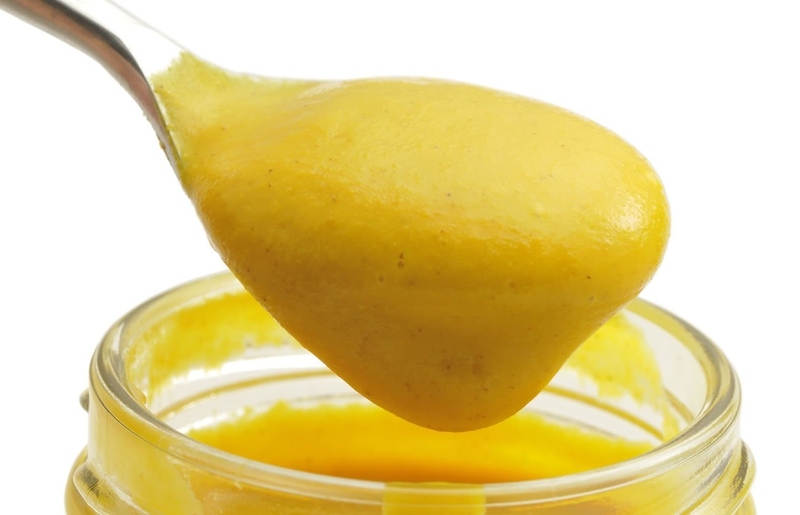 Grey Poupon mustard is free from ingredients containing gluten. However, for Grey Poupon products not labeled gluten-free, it is prudent to assume that they may contain some gluten as a result of cross-contamination or the manufacturing process. Products of Gulden's, a ConAgra Foods subsidiary include Zesty Honey Mustard, Spicy Brown Mustard and Yellow Squeeze Mustard. Similar to Kraft, Gulden’s mother company has a policy to provide information on gluten ingredients on product labels. While Gulden’s mustards are free of gluten ingredients, they are not labeled as gluten-free. This may be due to possible cross-contamination. The vinegar used by Gulden’s is produced from wheat or corn. Information by Heinz states that Heinz mustards available in U.K and U.S. are certified GF–20 and can therefore be considered gluten-free. However, if you are in Canada and wondering is mustard gluten free, go for Heinz Yellow Mustard as this is the only one considered to be free of gluten. The vinegar used by Heinz is derived from wheat or corn. Koops' manufactures mustards in eight flavors which include Arizona Heat containing green and red peppers, Honey Mustard and Horseradish. Koop’s products are labeled gluten-free. Organicville manufactures Dijon Mustard, Yellow Mustard and Stone Ground Mustard which are all certified gluten- free. The Gluten-Free Certification Organization certifies Organicville Company itself gluten-free because tests reveal that its products are GF-10, way below the required 20ppm. According to Rachel Kruse, Organicville founder, the company’s mustards are prepared with organic vinegar made from cane or corn, never wheat. You will realize that the subject of mustard is not straight forward. But you have many options to choose from. If you know what you are looking for, you can find a brand of mustard that is gluten-free certified. This is assurance that the manufacturer certifies that the mustard contains no traces of gluten so that you don’t have to worry if you have gluten sensitivity but love mustard. So, go on, choose your favorite mustard and enjoy your meals.